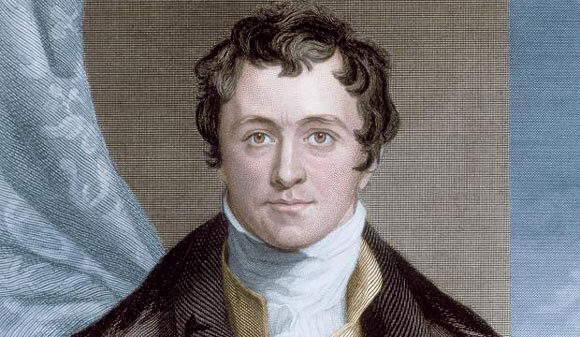 Humphry Davy, better known for his contributions to the discoveries of chlorine and iodine, was born on December 17th, 1778 near Penzance, Cornwall to a woodcarver. He received his education in Truno and the Grammar school of Penzance. During these days only a spark of knowledge and zeal to taste the scientific buds were seen in him. In 1794, soon after his father’s death he apprenticed a surgeon at Penzance, realizing his responsibilities towards his family as being the eldest. During this time, his meddling attitude helped him in discovering the anesthetic effect of nitrous oxide. He later published this research in his book “Researches, Chemical and Philosophical (1799)”. This inducted him in the faculty of the Royal Institution as a lecturer. He was one of the most admired person there and that drew a large number of audience in his lectures. He also became a member of the Royal Society in 1803 and received its Copley’s Medal in 1805. His next publication, On some Chemical Agencies of Electricity, was another feather in his hat. That very year, 1806, he also discovered that alkalis and alkaline earth are compounds substances formed by oxygen banded by metallic bases. He demonstrated it and proved that alkalis are simply metallic oxides. This is one of the most important benefactions in the Philosophical Transactions. By now he had become one of the most prominent scientist in Britain and was knighted by George III in 1812. After which he married a rich widow Mrs. Apreece. He published another book in the same year and that was “Elements and Chemical Philosophy” followed by another one, “Elements of Agricultural Chemistry”, in 1813. Analogously, Michael Faraday, saw one of his lectures in which Davy made observations about connections of science with other parts of social life in 1813. Faraday was so impressed by it that he became his assistant for 18 months and toured to Europe with Davy. This was the time he was investigating about the theory of volcanic eruption. Humphry Davy determined iodine, in Paris, for the first time. Here Napoleon even awarded him a medal. Prior to this, after the introduction of the first battery by Alessandro Volta, he employed that with what is called electrolysis today. In 1807, he even detached substances like potassium and sodium. Davy, later, studied the separation of these substances and invented a new field of electrochemistry. In 1815, he abstracted the flames from the gases, after the coal miners from Newcastle wrote to him about the fire and death of many miners resulting from it in the mines there. This was the time Davy sparked of the ‘Davy’ safety lamp. This was one of the major inventions he had done for the well being of mankind. In succession to this he was made the baronet in 1818 for all his contributions. A controversy also flew in after the invention of Davy lamp. George Stephenson, working in a colliery near Newcastle also made a similar kind of a safety lamp. Both men adjured that they were the first one to invent that lamp. Humphry Davy, in 1820, was promoted as the President of the Royal Society and served there on that post for 7 years when his health started to deteriorate and he resigned. Two years later on May 29, 1829 he died of a heart failure at Geneva and was buried at Cimetière des Plainpalais, Geneva, Switzerland. Even after his death his contributions towards the scientific world have been used all over. His work has encouraged manufacturers to take a scientific approach to production. His work is contributing in the improvisation of industries like mining, agriculture and tanning. He was a great man and one of the best scientist Britain has ever produced.